Of course, my own childhood provides no precedent to help me judge what an eight year old might do with a mobile phone. Not only were there no mobile phones when I was a child, there weren’t even landlines in many homes. I remember well the telephone from the house I grew up in. 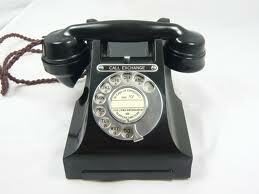 It was a classic, heavy, black bakelite number with a clicky, cold metal dial. 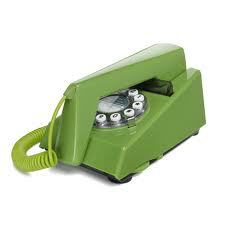 By contrast, my grandmother’s new Trimphone, circa 1970, was considered revolutionary. Like her new bathroom, it was in fashionable avocado green. It didn’t last long, though. A bird in the garden learnt to mimic its shrill ringing so she never knew when a call was coming in. My other grandmother had a neighbour who subscribed to a party line. This arrangement allowed two households to share a single number across two hard-wired handsets when there weren’t enough lines available to go around. These days, the idea seems an unthinkable invasion of privacy – though it would have made phone-tapping a lot easier, saving certain journalists a lot of trouble. The fact of my husband’s birth was relayed to his father, just home from his shift down a Scottish coalmine, by a knock on the door from the local policeman. “Mr Young, you’ve got another laddie,” he announced. Even so, I was astonished when my boyfriend at university would go home for weekends without heralding his arrival with an advance phone call. But he had no option. His parents weren’t connected to British Telecom (the only, nationalised service provider.) His father was holding out against installing a phone for as long as he could, fearful of the bill his garrulous wife would run up. A few years later, he gave in and his worst fears were realised. She used the phone during the day when he was at work so as not to incur his wrath about the bill, with the net result that the bills were even higher. She made up for years of being incommunicado with endless, pointless calls to her sister in Liverpool. “What are you having for your tea tonight, then? Oh? Will you have peas with it?” Ironically that boyfriend’s first job on leaving university was with British Telecom, about to be shaken out of the dark ages by privatisation. I still don’t like making phone calls, always thinking of the phone bill as I dial. My fear is misplaced. All calls from home are now free after 7pm and my mobile package offers me more free calls in a month than I am likely to use in a lifetime. Not so my daughter’s phone: she’s only allowed Pay As You Go, a small balance provided for emergencies only. I am therefore annoyed when in my study this evening, working just a room away from her, a text message from her pops up on my mobile. I grab the phone crossly, rehearsing a diatribe against inappropriate use of her phone credit. But my wrath is shortlived when I read it: “I love you, lovely mummy, even though you work so hard.” A message like that is worth 10p any day. If you enjoyed this piece of nostalgia, you might like this one about my childhood Christmases. What’s your attitude to mobile phones for young children? Do leave a comment if you’d like to have your say!